On the 5th of June 2018 the trial against the Harmanli 21 was postponed again. As last time, 10 of the 21 accused migrants were present. The hearing started with people in attendance to support the migrants. 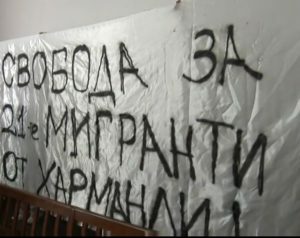 They took out a sign saying “Azadi” (the word for “freedom” in several languages) and showed as well a banner saying “Freedom for the 21 migrants from Harmanli” in Bulgarian. Afterwards they were expelled from the court room, one of the migrants was rudely silenced by the judge for thanking the protestors. The supporters claimed that they are not a part of any organization and just people, who came in solidarity. 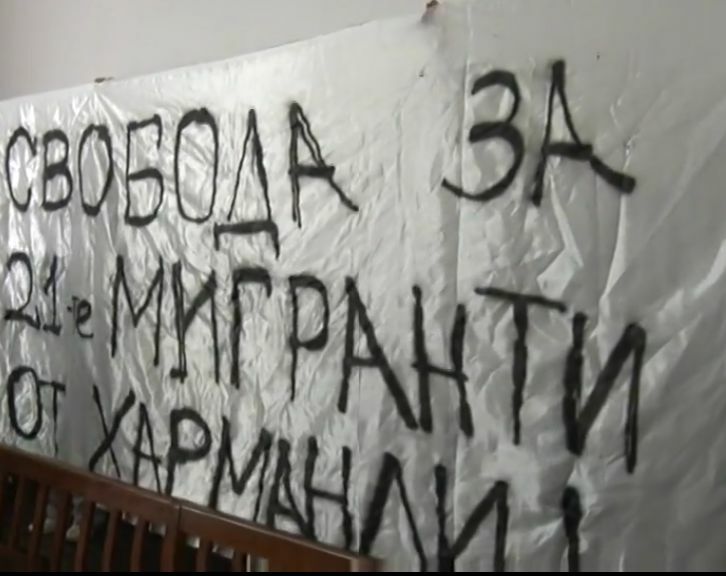 Some media did not quote their banner correctly afterwards and some media reports following the event on the very same day noted that among the supporters were „foreigners“ and not everyone spoke Bulgarian language. After the action, a journalist challenged the protesters with a question about police being injured during the riot. One of them answered, by stressing the fact that a 15 year-old boy was in a coma after police violence followed the riot and since then no police has been investigated or accused. The hearing continued although the statements from all lawyers were pleading against a start. They argued that one month has not passed since the start of the search for the 11 missing migrants. The trial was postponed until August 7th, 2018 at 13.30 h in the Regional Court of Harmanli. Dieser Beitrag wurde unter Allgemein abgelegt und mit Harmanli, protest, riot verschlagwortet. Setze ein Lesezeichen auf den Permalink.